"Okemah was one of the singingest, square dancingest, drinkingest, yellingest, preachingest, walkingest, talkingest, laughingest, cryingest, shootingest, fist fightingest, bleedingest, gamblingest, gun, club and razor carryingest of our ranch towns and farm towns, because it blossomed out into one of our first Oil Boom Towns." 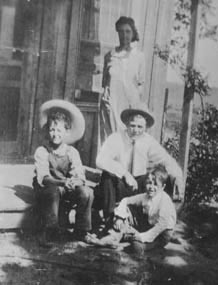 From left: Woody, Nora, Charley, & George Guthrie at their home in Okemah, Oklahoma, 1924. Woodrow Wilson Guthrie was born on July 14, 1912, in Okemah, Oklahoma. He was the second-born son of Charles and Nora Belle Guthrie. His father – a cowboy, land speculator, and local politician – taught Woody Western songs, Indian songs, and Scottish folk tunes. His Kansas-born mother, also musically inclined, had an equally profound effect on Woody. Slightly built, with an extremely full and curly head of hair, Woody was a precocious and unconventional boy from the start. Always a keen observer of the world around him, the people, music and landscape he was exposed to made lasting impressions on him. During his early years in Oklahoma, Woody experienced the first of a series of immensely tragic personal losses. With the accidental death of his older sister Clara, the family's financial ruin, and the institutionalization and eventual loss of his mother, Woody's family and home life was forever devastated. In 1920, oil was discovered nearby and overnight Okemah was transformed into an "oil boom" town, bringing thousands of workers, gamblers and hustlers to the once sleepy farm town. Within a few years, the oil flow suddenly stopped and Okemah suffered a severe economic turnaround, leaving the town and its inhabitants "busted, disgusted, and not to be trusted." From his experiences in Okemah, Woody’s uniquely wry outlook on life, as well as his abiding interest in rambling around the country, was formed. And so, he took to the open road.